Mark Ostoich has been a CCM faculty member since 1996. In connection with CCM, Ostoich has served as artist-faculty of the CCM Spoleto Festival in Spoleto Italy, as well as the Lucca Festival and Opera Theatre of Lucca (Italy) and CCM’s Grandin Festival. He performs extensively in solo and chamber music settings and is in demand as a recitalist and clinician for master classes. Along with clarinetist Steve Cohen of Northwestern University, and bassoonist William Ludwig of Indiana University, Ostoich performs and tours regularly as the Trio Cayenne and Lyric Winds. Ostoich has an extensive orchestral background and is frequently called upon to perform with the Cincinnati Symphony Orchestra, Cincinnati Chamber Orchestra, Cincinnati Ballet, Columbus Symphony, Columbus ProMusica and Dayton Philharmonic. He has performed as second oboe of the New York Philharmonic, associate principal of the Pittsburgh Symphony Orchestra, second oboe in the Cleveland Orchestra and principal oboe of the Louisiana (New Orleans) Philharmonic. He has held the principal oboe position of the Santa Fe Opera, was principal oboist of the Jacksonville Symphony for 12 seasons and was the principal oboist of the Baton Rouge Symphony for 13 seasons. 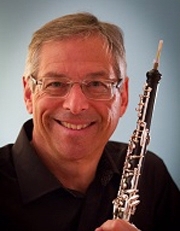 For the last 16 years he has been the featured teacher of the Oboes at Oxford oboe camp, now held at Reinhardt College in Georgia each July and Midwest Oboe Camp at Wittenburg University in Ohio. He has also served as artist-teacher for the Advanced Double Reed Institute in Texas. Ostoich was formerly professor of oboe at Louisiana State University and the University of Florida, the University of Texas and Ohio University. He was artist-teacher of oboe at the Sewanee Summer Music Center and member of the Sewanee Wind Quintet. He received the DMA degree from Louisiana State University where his primary teacher was Earnest Harrison, and major influences in his career include John Mack, Joseph Robinson and Christopher Philpotts. BM, MM and DMA, Louisiana State University, Baton Rouge, LA.